Antiques challenge. Auctioneers Charles Hanson and Raj Bisram take their Triumph through Somerset, Dorset and Hampshire before ending at an auction in Swanmore. Browse content similar to Episode 7. Check below for episodes and series from the same categories and more! Discover the new Facebook emoticons! It's the nation's favourite antiques experts. I don't know what to do! With £200 each, a classic car, and a goal to scour Britain for antiques. The aim, to make the biggest profit at auction, but it's no mean feat. Back in the game! Charlie! There'll be worthy winners and valiant losers. So, will it be the high road to glory or the slow road to disaster? 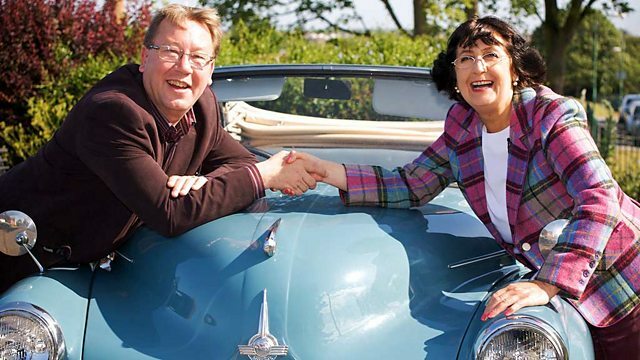 This is the Antiques Road Trip. Welcome to a taste of the West with Charles and Raj. Last night I had a pint of Somerset cider. Do you know what I really enjoy? If it's not cider, I love cheese. -Oh, well they make a very nice brie in Somerset. are actually here to gobble up bargains. This is a treasure island and I just want to dig with you. Dig that, Charles Hanson, our auctioneer from Derby. Antiques expert and Rams fan. At the moment it's Hanson - 1, Raj - 0. Can it be 2-0 in Somerset? our auctioneer from Kent, has anything to do with it. I was a downhill racer. -Which means that I'm going to go flat-out to win. Highly competitive between these two, and it's only the second leg. with £259.58 to spend today. has done even better with £317.46 at his disposal. And boy, I love how you say Charles, say it again to me. -Yeah, I like that. Yeah. You say it in a nice ring. up about 900 miles later at Crewkerne, in Somerset. antiques outlet is housed in an old primary school. -Good morning, sir, how are you? they must be worth upwards of £50,000. I think that might even be on the low side, Charles. Academic, really, considering your budget. They were strong in the arm in the Victorian times. our Charles will have to be on top form here. In this cabinet here, is some really good blue and white porcelain. Now...be careful, don't drop it, Charles. Took the words right out of my mouth! the value can be ten times more than the more bog-standard. So I'm just having a quick peek in here now. Nice. Put him up there. They're lovely. Ah! I've got the six. Knowing Les, I reckon the six could be £1,000. If you don't ask, you never find out. But I don't really want to sell it. One more thing that I pulled out, this little tea bowl here. -I think it probably is. Could be 40 quid? The other piece is a good early lot. -Yeah, you can have that for the same price. You're not in Derbyshire now, Charles. Thank you, Les. I shall think on. I could take a chance, my mind's ticking. The gamble could be on. was almost £40 on a little derby ewe. Be careful, Charles, have another look around at least. Oh, I quite like these figures down here. You've got him and her, they're still together. who was a very important modeller at Royal Worcester. They've had some restoration, what a shame. Look at that one there, and look at the difference. with your Hadley his and hers ladies. -How much are they, for the pair? I like those. Time to take another peek at the old china, then. if I could get a bit off because he's come straight in at £200. Next door to these are also these bits of broken Chinese porcelain. anything on these bits of broken Chinese bits here? £225, and you can take the lot. -I tell you what, 200 quid. I would think that would be reasonably accurate. You know you're going to. -Yeah, I will. Thank you very much. -I knew you would. I've been done! I'm not so sure, Les. They're certainly a big gamble for Charles, not that he seems too worried. in the history of English Romantic poetry, Coleridge's cottage. -Hello, nice to meet you. It's nice to meet you, I'm Raj. What a lovely place. when a meeting changed his life. when he met William Wordsworth in Bristol in 1795.
something that each of them had, a spark of genius. That was a hugely profound moment for both of them. And, they became friends from that moment onwards. moving his family to this cottage in the foothills of the Quantocks. and wrote works like The Nightingale and This Lime Tree Bower, My Prison. how it makes us feel. the way it was structured. This was just in the language of ordinary men. So, Stephen, most of his famous work originates from here, the cottage? one of his better known poems was written in this parlour. It's 1798, in February and it's absolutely silent. the flame was this sole, quiet thing. His son, Hartley, was lying next to him in his cot here. And it's one of his most famous poems. and soon he moved close by. Together they caused quite a stir. experiencing nature at a different time of day. they were mapping the area for the French to invade. he fortunately realised that they were just poets. That was it. -That was the end of it. a work which was a landmark of the English Romantic age. This is the Lyrical Ballads. in terms of English literature, it's huge. became so famous that a particular phrase entered the language. Nor any drop to drink. and then quarrelled with Wordsworth. and was encouraged by Byron to publish Kubla Khan. Coleridge died in London, in 1834, aged 61.
it's very rare you won't hear the name Coleridge in the same sentence. The two of them are always linked. his poetry that was written here is still remembered today. of the Romantic poetry movement in this country. Now, back on the lonesome road, our two travellers are together again. -I thought I might become a driving instructor. Yeah, and I might become a ballroom dancer! Ha! Getting along famously, aren't they? let's knock on the door. Yeah, maybe we can be like rag and bone men. that there may be a bargain around here somewhere. -No, I won't be too long. -I've got shopping to do. Not sure Brian's workshop would be Charles' sort of thing anyway. I'd like to sell this, but I can't. Well, to be honest, this is a little on the big side for me. This is the only one in the world. -It's the only one in the world? -And what exactly is it? made by Paxman's of Colchester. which would be very, very attractive to the right people. -If you wanted it, I'd sell it cheap. To be honest, I haven't got a clue what it's worth. But what are we talking about? A tenner? Can I buy it for a tenner? -What about £20 and I'll just take a chance? -Fantastic! Thank you very much. There's no maker's plate, but I would say it's got to be 100 years old. Well, at least it's an antique, then. Are you being serious? I can hear something jangling in the back. -What's going in the boot? There's a fair weight in there. -Yeah, mind the back axle. -Fine. Thank you very much. Point to Raj, I reckon. -Why don't you, yeah, just pump it a bit? -You'll want an ambulance pump in a minute. just outside the south Somerset town of Somerton. Somerton was once the county town. it might have been the capital of Wessex. -Sorry, afternoon, I beg your pardon. -Pleased to meet you, my friend. so what, we wonder, will his tactics be here? I've had a very eventful morning of big spend. but ready...to go, go, go. I think you're using it in your shop, this lucky dip bin? -Could it be for sale? OK, it's not very old. What could it be, 1960s? -Was it your era, Paul, the '70s? -There we go, there we go. I'm normally very much into my antiques, Paul. An antique by definition needs to be 100 years old. -it's a yesteryear object that takes you back to your childhood. But what's the best price? £70 and you get the free gifts? -You get the free gifts as well. -What are the gifts, Paul, inside? -I can't tell you that. -You have to pay 50p to buy one. the best part of 150 presents in here, mustn't there? -I don't think there's that many. About 80. So, I might give the gifts a miss. I could then almost...have £40 off? -Really? What's his name, by the way? Has he got a name? -I might call him Charlie. So, £40 and on the shortlist. -And elsewhere in Somerton, Raj is on the prowl. Nice to see you, it's Andrew, welcome to Market Cross Antiques. Hello, Andrew - nice to meet you. Lovely looking shop you've got here. -Oh, yeah? No seaside clowns, though. Oh, well - I'm sure he'll find something. It's really nice to actually come in the shop and see so many antiques. Well, a quick look at the sign would have done it, Raj. There's a nautical cookery book here. It's a lovely little thing. I've never seen a nautical cookery book before. This dates from about 1920, 1930. It's an unusual little piece. "for the use of stewards and cooks of cargo vessels. so they didn't eat too badly, did they? but if I get this for a fiver, I might do quite well on this. I'm beginning to think that everything I buy is a fiver. You're not alone there, Raj. How's the lucky dip going? -which appears to be a little Eastern cobbler, isn't he? -What's your best on him? -Yeah, you see, you're good. Royal Doulton, there's always a guide price to help out. So there he is, HN1706. His retail price is 275. When it comes to auction, you normally drop it by about 75%. It's a good price - food for thought. It's like an episode of Batman in here. Holy knick-knacks! He's already got plenty to ponder. ..and bought the clown, what would be your best prices to an old mate? What do I really want to do? Getting tense. Time for a spot of Somerset air. I might take the two and then work it out later. Is there anything you could do on the £70? -We'll go down to 60. That's a good price. I just wonder if I could perhaps acquire them both at £25 each? £50 the two. They got there. Now, I wonder what Raj has unearthed? I've spotted a pair of watercolours by a listed artist. This is by... I believe it's Abraham Hulk. It could be either Hulk senior or junior. Anglo-Dutch painters of maritime scenes. I'm going to really chance my arm on these. Time to pipe Andrew aboard. and the auction they're going to is on the coast. -But I'm going to be cheeky. -I can do you a good deal on these. I bought them, they came with another watercolour I really wanted. that gets us ahead of Charlie Hanson. Hear that! He's practically on your team. -I mean, would you take £20 for them? -Yeah, go on, as it's you. Yeah. You've got yourself a deal. -You want to give me some more, don't you! Well, I WAS going to go higher, but I'll tell you what I'll do. -To be fair, I'm going to give you 25 for them. -25, we've got a deal. -Well, that is a first. -I've seen something else. While I'm on a roll! -We're on a roll now, aren't we? -Yes! Can I show you this? This just a nice little nautical cookery book. Can I offer you a fiver for that? I can go make a phone call and find out for you. I can't believe I got the pictures for £25! -They've got to do well. I've given the dealer a phone call and the best she can do is ten quid. -I've got to squeeze you on this one. -You've got a deal. Thanks very much. -I'll sort her out for the other. While you're here, is there anything else nautical that you can think of? I'll take a bit of a look around and see if I can find something. -with it, make it a little bit of a job lot. He can't stop buying, today. I was just thinking there's a nice flag here. Got a bit of age to it, St George's flag. -Yes, that might go perfect with the book. -Can I make you an offer? -Will you take a fiver for it? Yeah, go on - I'll take a fiver for that. and another nautical lot of the cookbook and the flag. I think he's been inspired by The Rime Of The Ancient Mariner. but it's just a pretty little sloop. I should think this is as modern as anything. is a sailing boat with a single mast. The ticket price is £24. -Just give some more oomph to the lot I've got. Yes, it's growing into a convoy! This sloop, here. The absolute death on it is half price, 12. -I'm not going to quibble on that. -OK, thank you very much. That's good. -Not a bad haul, Raj. Now, back to the driving lessons. -always go into first gear. Today is someone's very special day. -How old are you today? some watercolours, a cookbook, a flag, a sloop and a steam boiler. and enough tea bowls to open a cafe. -things seem to be a bit more expensive down here. So, he's got just under £70 left for today's bargains. a real pleasure. What are we stopping for? Sorry, I was looking at a sign back there. -I thought it was a stone, I thought it might be for sale! is at Wareham in Dorset. Between the rivers Frome and Piddle sits the delightful town of Wareham. I wonder if our birthday boy will find a pressie? -Lovely to meet you, too. Very nice little shop you have here. Anything that you think would be a good little buy for me? We've got what I thought was a Chinese or Japanese cup, there. and she actually said it was English. -that went for about 20 million! -If only, that would definitely upset Charles! Yes, I think it would upset me as well, a little bit! -Yeah, it's a 19th-century copy, isn't it? But it's unusual to have these marks on the bottom. If I was going to put money on that, I'd have said it was Japanese. -What could you do it for? To give you a chance, I could definitely come down to 20 for you. I guess they said it was what, mid-19th century? Yes, I reckon it could be a little bit older. I reckon it could be 200 years old. It's got a lovely little design on it, too. It's got the Japanese lady there. Lots of people collect it. -Well, we know two, anyway. Yes, I reckon you'd have a chance at that. It could create a buzz at the auction. I think Charles has similar hopes, Raj! -What else do they have? -Here's a nice old piece. we have a collection of gavels! I wonder when he'll finally splash some serious cash? What do you think is your rarest piece in here? These are actually quite nice. We had these looked at, they're solid silver. It's actually a Danish silver mark. That's quite an unusual design. What have you got on those? 169. They could be Georg Jensen. Georg Jensen is one of the most famous Danish makers. Just as a matter of interest, what would be the best on these? I might be able to do 100 on them for you. online, I think I'd snap those up. -I think because I'm not sure, Jake, I'm going to have to leave them. I thought we were getting somewhere, then. -Chess sets suit you better, sir? I'd say this was probably early 1900s. -What have we got on there, 29? I can certainly come down to 20 for you. To be honest, I'd want to be paying more about ten. How about meeting in the middle at 15? I think there's definitely a profit in this, Jake, with that at 15.
if you know, but I'm up against Charles Hanson! I suppose Charles ought to be flattered by such tactics! All right, then - to give you a chance, I'll do it for a tenner. How can I turn down a chess set for £10? There is actually a wooden board down there. but it might be something that you could look at. That's not a bad board. -Can you do that for a tenner? So, £20 for those and £20 for the cup and saucer. -He's got quite a pile, now. tiny cottage that was once the home of a legendary British war hero. I feel like saying, "I'm Hanson of the Road Trip!" came after his famous exploits during World War I. "the brutality of the barrack life" and it's very individual inside. when he rented this old forester's cottage. Wowee, Alison - it's just a cottage like no other. It is a tiny cottage with just four rooms. It's so dark in here - why is it so dark? we've kept it the way Lawrence had it, with no electric light. When was the building given to the Trust? In 1937, his brother gave it to us, so just two years after his death. We've been looking after it for nearly 80 years. it's just how he left it. -We have it very much like that. the man who brought about the Arab Revolt against the Turkish army. he'd absorbed their manners and he adopted their dress and he enabled them. He just was this unique character, which they adored. because he showed that whatever they could do, he could do as well. in at least eight languages created a bolthole to match. Is this a bedroom, then, or...? -Lawrence didn't do anything in a conventional way. He used it more as a couch, somewhere to sit and look at his books. Yes, maybe talking to friends. Then, in the middle, you can see there's a sleeping bag. -Upstairs, you'll see the one that goes with it, "Tu um" - yours. Even this chair, I've never seen such an angular Art Deco chair. -That was made for him. he was probably only about 80lbs. -He'd lost a phenomenal amount of weight. He's got sheepskin, so it'd be lovely and warm at his back. He would have had it turned around, feet on the fender, reading his book. -He designed this and had it made by some friends. so he didn't have to hold his own toasting fork up. This comes out, you pop your toasting fork in there to toast your bread. it really is quite a special feeling. But crumpets aside, Lawrence was no cook. and added a bed for his overnight guests. Lawrence did his entertaining upstairs, in the music room. It's so different. What I love is this huge gramophone. I've never seen such a big horn. I mean, it's almost like a bachelor pad. -because they had more impact. would apparently sit round clutching a tin of olives - Thomas Hardy, too. Although there is a bathroom, I wonder how they coped without a loo? -So no toilet, but hot water. essentials and his luxuries were his hot bath, his books and his music. I like his style. I'd better go. It's been wonderful, thank you so much. I think nature is calling! Let me show you where the spade would be, by the front door! enjoying one last shop - together. -If you can park up up there, I'd appreciate it! -He won't let me in! -Yes, best behaviour. Hello, Carol. -How do you do? Nice to meet you, I'm Raj. Which way are we going?! We can hardly blame him for getting a little overexcited. with a bit of French influence here and there. -You like oysters, don't you? -Well, I don't, but my husband did. I've noticed in all the rooms are these beautiful oyster dishes. Yes, that's quite a nice one, that oyster plate. That's quite nice. That's French. Dating it, I would say between 1890 and 1910. That one's in good condition, too. How much could you do this for? Could you do it a little bit less? What do you mean by "a little bit less"? -It's not going to be a tenner! -Has she seen him in action?! Oh, I don't know that I could do 30. -I'll do 35 just to be... Just to be nice. -Are you sure you're happy with that? thank you very much indeed, Carol. -Now, what's Charles up to? -I quite like this lamp over here, Valerie. jumps out because it's probably eastern. in this lustre, oily bronze. I'm so sorry, but it isn't for sale. -She wouldn't be open to an offer at all? That is unfortunate! Although his rival may not see it that way. -Have you bought up already? -I think I might have done. -OK. Well, the world's my oyster! -Funny you should say that. so let's have a look at what they'll be taking to the auction. Raj parted with £145 for a steam boiler. A flag. A sloop and a cookbook. A chess set and board. And, finally, an oyster dish. While Charles spent £250 on a clown. that he's dividing into three lots of two. Get it? So, what did they make of each other's buys? for being a bit of a clown. I just can't believe that steam boiler. I think it cost £20. Market value probably today is more like £10. I do like the Worcester blue-and-white bowls. I do like the 18th-19th century-style tea bowl and saucer. In fact, it's more like 1920s. Full of Eastern promise, I doubt! close to the Hampshire coast at Swanmore. The car is purring. You are driving it like a man. Your feet look better on the pedals as well, sir, I don't know why. -Are you wearing different shoes? now converted to a quite different use. I wonder what auctioneer Dominic Foster thinks will prosper here? Period ceramics don't sell that well. Things like the period Worcester might be a little bit slow. could be used as a stick stand or in the garden, something like that. Hey, I didn't see that coming. So, boiler time for Raj. Heavy enough. But how hot can it be? -I've got 40, 50 and I've £60. -£70 here. 2 anywhere? 75 here. -Keep going, I need it. -75, I'll sell it then at £75. Give me a high five. Next up, it's Charlie the clown. Look at me, son, when I'm talking to you. Bids on it here, I've got 40, 45. -Good man, we're going, we're going. 58, 60. At 58. 60 anywhere? Oh, is it my lot, is it my lot? Oh, no. -Sell it for £62 then. -Was that for the clown? -Do try and keep up. Next, it's Raj's little maritime collection. A couple of bids here, 20, 24 here. -You've got a gift, you have. No, at £50. Sell it at £50, then. How will his Hulks fare? -What were they priced at originally? -And they cost you 25. -Crikey me. I like your style. -It's the way I smile. Again, a couple of bids here. -I've got 40 and 5. £48. 50 there is. 2 anywhere? 52. 55, sir? Yes? No. 55. 58. 60. 2. 65. 2 anywhere? £70. 2 anywhere? Not quite the smash he was after. But not bad. in your profit-making machine, in which you are. Because I know I'm up against admiral of the fleet. I tell you what. Hanson's walking the plank at this rate. Enough. Time for Raj's chess gambit instead. 35, 38 here. 40 anywhere? 40 there is. 2. 44. 46 anywhere? Sell it then and £44. Now, what about Charles's china part one? -I've got 38, I got £40 here. 42 there is. 44. 46. -So, at £58 here. 60 anywhere? That's good, that's very good. Yep, not bad for the makeweights of the deal. Time for Raj's blue and white. It might not be Ming but here goes. 15. I've got 18. 20 is there? I've got 2. 24. At 24 here. 26 anywhere? -At least it's a profit. But how will Charles' big buy fare? The first of his three pairs of tea bowls. Bids on the book, yes. 44. 46. 48. 50. And 2. 55. -Here we go. Yep. Profit. 65, 68, At 65. 68. 70. No? At £88. 90 anywhere? Two fat ladies at 88. Sell them at £80 then. But they're still great value, they're still great value. More of that, and he'll do fine. I've got 50, and I've got £60. 2 anywhere? 62, 65. 68, 70. -Two fat ladies again, it's two fat ladies. I've now got four fat ladies. £40 for them somewhere? 40 bid. 2 there is. 70. At £68. Oh, no. 70 anywhere? -I didn't make six fat ladies. No. I think in "Mingo" that's called saving grace. Strangely enough. Raj's big spend, the oyster dish. I'm not going to make a loss on it but it's a lovely thing. -It could make a loss, let's be honest. -It could make a loss. -Put it there, you've done it. 36 there is. 38, 40. 2 anywhere? -At £40 here. 2 anywhere? -It's worth more than 40. Definitely worth shelling out for. Raj is just in front on this auction. But it's never over until the cobbler's cobbled. -Couple of bids with me. 40 and 45. 50 here. And 5, sir? 55. Sell it at £55 then. So, who's coming out on top today? The competition is sparking. Come on, I'm sparring, let's go. After paying auction costs, he made a profit of £93.58. So, he still leads overall with £411.04. But Raj wins the day. leaving him with £363.04 to spend next time. You're on the road now. You're showing me the way. And the way is Dorset. Next on Antiques Road Trip, a little of what you fancy. -I don't mind if it's a bit old. And, not everyone's cup of tea. It's not minging. But, in fact, this is Ming. It's leg two for auctioneers Charles Hanson and Raj Bisram as they take their Triumph through Somerset, Dorset and Hampshire before ending at an auction in Swanmore.